1. 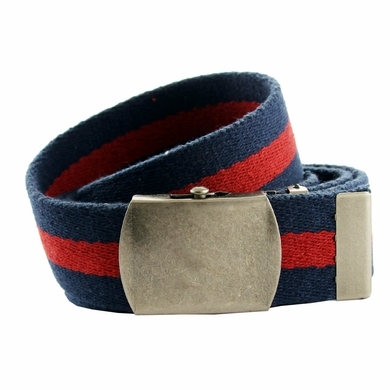 5 Inch Premium Striped Cotton Fabric Belt. You can feel the quality; looks outstanding. Features and Benefits: Quality constructed with 1. 5 inch wide extra thick, premium, cotton web fabric. Clamp-on, Antique Nickel buckle with matching metal tip. Size: Adjustable to 44 inches. This cut to fit belt can be shortened by prying off the buckle and using a scissors to trim down the length to a size that works best for you. When done replace the buckle and you have a perfect fitting belt.